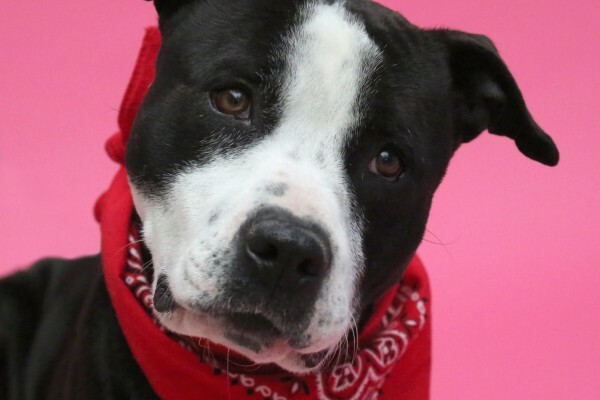 Ari was a participant in our 2016 Change a Pet’s Life Contest, and he is still looking for a forever home! This 5-year-old German shorthaired pointer is available for adoption through the Wisconsin German Shorthaired Pointer Rescue, Inc.
Ari came into WGSPR in September of 2015. 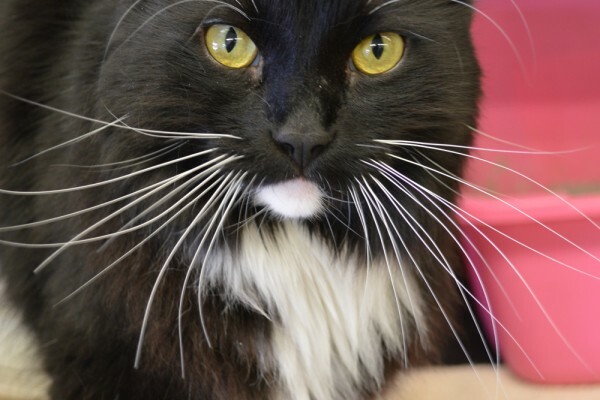 He has diabetes and is still looking for his furever home. His tail wags more than not, and he is an extremely friendly dog. He warms up quicker to women, but men don’t worry–he can be your best friend too. He is vocal, but at the moment, he talks for water, play and just plain old attention seeking. He thinks of himself as an alpha and definitely gets along with less dominant animals. He recently has gotten along with the cat in his foster home, although they have limited exposure to each other, due to the cat avoiding interaction. Ari’s favorite game is tug of war, although chase and catch are also favorites. He continues to be able to leap (tall buildings?) well, pretty high and is working on invisible fence training. He definitely seems to know what the warning beeps mean! His nose has come into its own–just take him on a walk in the woods. In general he doesn’t appear prey driven (in the backyard with the tweety birds), but he has had limited exposure outside of the yard. He is not gun or thunder shy, as far as we know, and he sleeps through most noises. Ari continues to take his Insulin easily and blood sugar tests like a champ. He has gained some weight (8 lbs.!) but still checks out as healthy and not overweight. The food and insulin regimen must be working in his favor. Ari saw an ophthalmologist in April for his diabetic cataracts, and he doesn’t need glasses! His eyes look great and the cataracts have not changed since January. We have started Ari on eye drops to continue to keep his eyes in great shape! 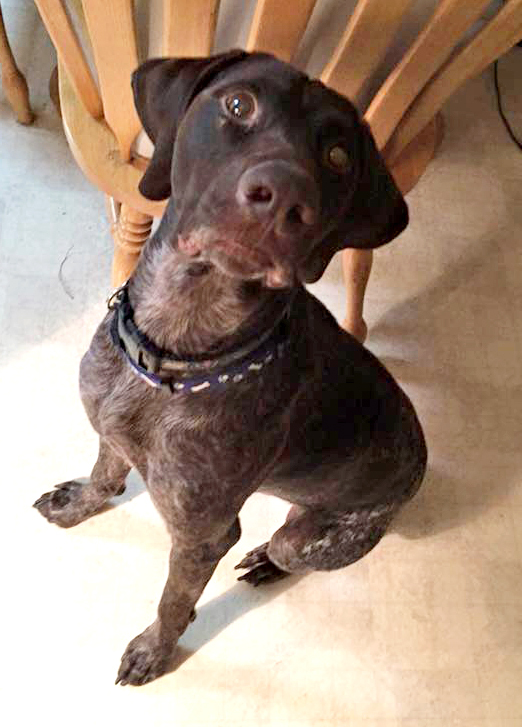 Ari is available for adoption through the Wisconsin German Shorthaired Pointer Rescue, Inc. in Alma, Wis. If you’re interested in adding him to your family, please visit the rescue’s website and fill out an adoption application. I love all animals but have been looking to adopt a Pembroke Welsh Corgi for years but just cant find one I know some where there is a Corgi who needs a loving forever home I have one just waiting here. Please help if you can. Janet, I don’t know where you live, but in Tulsa, OK the local kill shelter frequently has corgis…and transportation could be worked out. I’m a volunteer there. You can check nationwide for one at http://www.petharbor.com. Just search by your zip code & “dog”. do not specify any other filters because often dogs will be mis-labeled, etc. You can see pics there of any in other local kill shelters across the nation…just pick how far a distance from you that you want to search & check the shelters/rescues that come up. You will DEFINITELY be saving a life! Let me know if I can help.